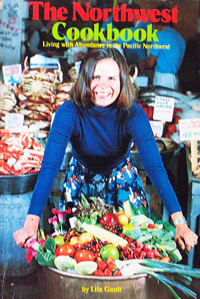 Lila Gault is the author of The Northwest Cookbook: Living with Abundance in the Pacific Northwest (1978), an extensive collection of regional dishes. The recipes come from Gault's own kitchen as well as from some Bainbridge Island residents - a current library staff member among them - who contributed family recipes and their gastronomic talents. It is also interesting to note that, written at a time when fresh herbs were considered exotic by many, Gault's emphasis on fresh and locally grown foods is surprisingly up-to-date. Gault is also author and/or co-author of Cider Book (1980), The House Next Door: Seattle's Neighborhood Architecture (1981), and Small Houses (1983).